Cosmic Bhaishajyaguru illuminates the universe and is master of healing, physical and spiritual. He is here in triad with the sister Bodhisattvas of Sunlight and Moonlight. The dharma wheel is precious to all seekers of truth. Its eight spokes represent the eightfold path, as its circle symbolises the perfection of Buddha’s teachings. Sanskrit for “sacred centre”, this holy pattern guides the wearer in meditation and takes one a step closer to spiritual perfection. Most ancient of Buddhist symbols, the eight-spoked Dharmachakra wheel crowns an endless knot, and evokes every symbol and teaching of Buddhism. 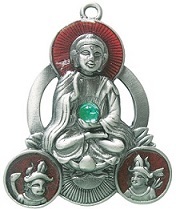 The female Prajna (Wisdom) and the male Karuna (Compassion) unite in this deeply symbolic pendant, as the Deities conjoin to achieve Enlightenment. Avolokiteshvara leads seekers towards enlightenment. All-seeing eyes and a thousand embracing arms lend comfort and help to each in their struggle. After years of searching and meditation, Prince Siddhartha Gautoma found enlightenment under a sacred fig tree. This beautiful pendant subtly celebrates his moment of Truth. 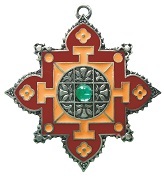 The shining jewel purifies the heart and represents all the treasures of Buddhism. Known as the “wish granting stone”, it is said to satisfy sincere desires. Avalokiteshvara promised to free all from suffering, but split into thousands of pieces. Kindly Buddha transformed him and, as a being with eleven heads, he calms distress in every direction. 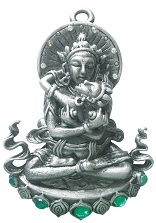 Vajra is symbol of three stages experienced in attaining Perfection. Meditation on the jewel at its centre helps the wearer reach this state of being. Padma Shrivasta shows the interdependence of all things. With no beginning and no end, this sacred icon means Long Life and Eternal Love.